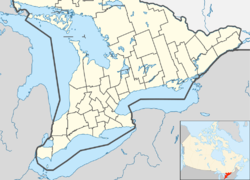 Bayham (2011 Population: 6,989) is a municipality in the southeast corner of Elgin County, Ontario, Canada. It is south of the town of Tillsonburg and Oxford County. Bayham was named in 1810 for Viscount Bayham Charles Pratt, a friend of land grant recipient Colonel Talbot. The township was incorporated on January 1, 1850. The villages of Port Burwell and Vienna were incorporated as separate municipalities and separated from the township in 1949 and 1853 respectively. In 1998, Bayham was re-amalgamated with Port Burwell and Vienna and Eden to form an expanded Municipality of Bayham. The municipality comprises the communities of Corinth, Eden, Froggetts Corners, North Hall, Port Burwell, Richmond, Springer's Hill, Straffordville, Vienna and Wadger. ^ a b "Bayham census profile". 2011 Census of Population. Statistics Canada. Retrieved 2012-08-09. Wikimedia Commons has media related to Bayham, Ontario. This Southwestern Ontario geographical article is a stub. You can help Wikipedia by expanding it. This page was last edited on 1 January 2019, at 21:06 (UTC).